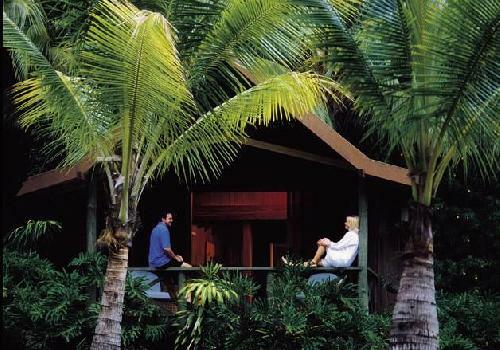 As the name suggests the Hamilton Island Palm Bungalows provides a range of bugalow style accommodation in the middle of Hamilton Island that is very affordable and has been specifically designed for couples and families who are looking to holiday in the Whitsundays on a budget. All of the freestanding bungalows are simple yet very well equipped and provide you with a unique back to nature experience that will have you coming back again and again. In all of the Hamilton Island Palm Bungalows the main room has a comfortable king bed and sofa, LCD TV, air-conditioning & ceiling fans, private balcony, ensuite bathroom with shower, bar fridge with mini bar, beach towels, daily servicing and a 24 hour reception for your convenience. The main pool and Catseye Beach are just a short 2 minute walk from the Hamilton Island Palm Bungalows and guests will enjoy the complimentary use of non-motorised water sports equipment, including catamarans, paddle skis, snorkelling equipment and windsurfers. Whilst staying on Hamilton Islands you can explore over 20kms of bushwalking trails or make the most of the free use of the island's gym, spa, sauna, tennis and squash courts. With such a central location the Hamilton Island Palm Bungalows are within a short distance from over 60 different activities that the island has to choose from. This includes tour operaters that have cruises to the Great Barrier Reef and nearby Whitehaven Beach, sailing, bushwalking, snorkelling, scuba diving, watching the sun set over the water at the superb Hamilton Island or relaxing on the sand at Catseye Beach. You can also play a round of golf at the Hamilton Island Golf Club on nearby Dent Island, which is an 18-hole championship course that makes the most of the island's terrain and provides you with 360 degree views of Hamilton Island and the Whitsunday Islands.